I skied 2,000 kilometres across the barrens of Alaska in the darkest months of winter to find one. I scaled Borneo’s highest peak—the 4,100-metre Mount Kinabalu—to reach one that was remoter still. Indeed, the more remote the better, I say. I’m talking about pubs—the most isolated ones on the planet. It’s been a challenge of mine to find them and bag them all. In North America, it was the Board of Trade in Nome, Alaska. Patriot Hills base camp in Antarctica is a seasonal tent city on that frozen continent. For three months of the year, when the sun never sets and the base camp hums with activity, there’s a special canvas abode where a thirsty patron can be readily served. Few will argue the inaccessibility of this unlikely gin mill and to my mind it’s the remotest pub in Antarctica. Yet after all these voyages, one establishment still eludes me. Tucked away deep in the mountains of western Scotland is a tiny public house with the enticing title of remotest pub in Great Britain. 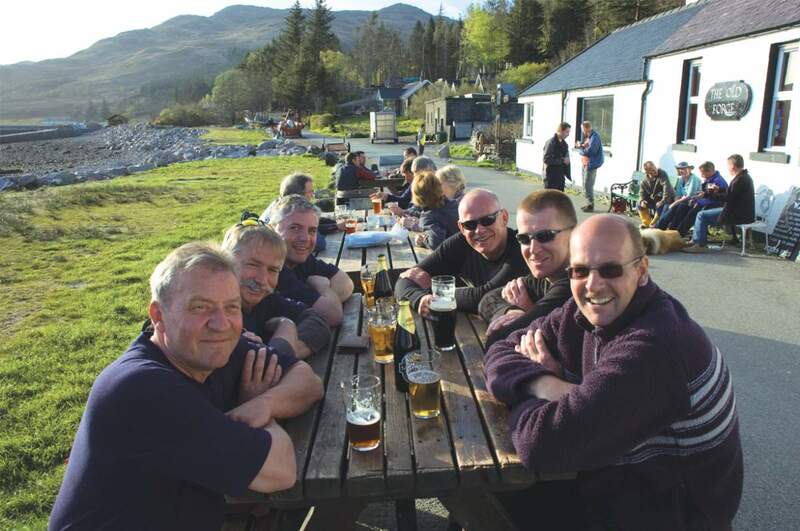 The Old Forge is located in the tiny hamlet of Inverie on the Knoydart peninsula, nestled between Loch Nevis and Loch Hourn—or Loch Heaven and Loch Hell as they’re commonly known. It’s a roadless community, accessed only by a 12-kilometre sea crossing or a 30-kilometre trek over the Scottish Munros. 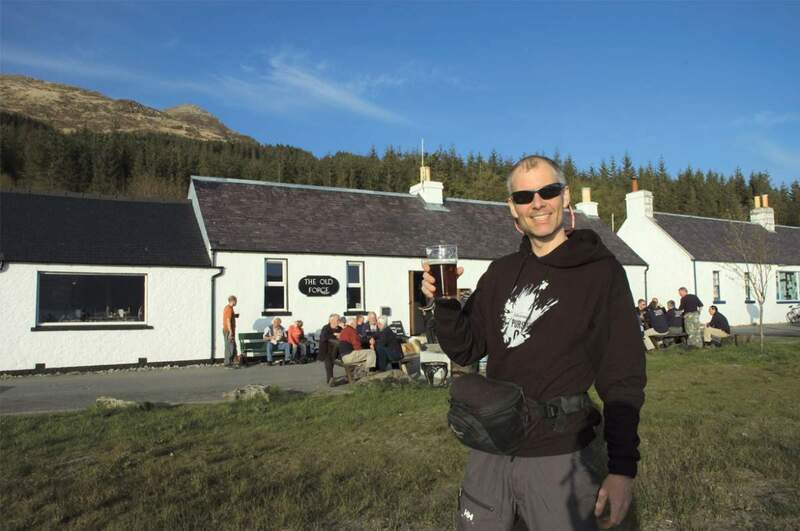 That isolation has garnered Inverie’s tiny tavern a Guinness Book of World Record’s recognition as the remotest of its kind in mainland Scotland and Great Britain. The fact that my good friends Dave Norona and Frank Wolf had joined me in Scotland on an Outpost assignment, participating in the multi-sport Drambuie Pursuit adventure race, made the pub-bagging a possibility. We had no choice but to make an attempt. The pursuit of remote liqueur-related objectives proved great training as our team won the Drambuie Pursuit and wrested the Champion’s Bottle from the reigning Scottish champions in the final stage of the race. Standing atop the winner’s podium, the haunting cry of bagpipes filling the moist highland air, we stared eastwards knowing that a trek across heaven and hell lay waiting. It’s a quick drive cross-country from the Drambuie finish line in Inverness to the town of Glenfinnan and the start of our quest. A tower with a statue of Bonnie Prince Charles, who initiated the last Jacobite uprising in 1745, marks the beginning of the foot trail and is a famous flub as the figure of the prince was modelled after the wrong fellow because the sculptor was told to copy the incorrect image from a painting. A cool, offshore wind blows down the valley as we begin our trek. It’s the end of April and temperatures here are still only in the low- to mid-teens during the day. Our time in Scotland is very tight and we need to reach Inverie by the following evening. The bi-weekly ferry out of town leaves the morning after that and if we miss it we won’t make our flight home. It’s already 5 p.m. Our objective this evening is to reach the A’Chuil bothy, a small mountain hut some 10 kilometres away. The race is on. The first couple of kilometres of route are a paved roadway that slowly deteriorates to a gravel path until it finally gives up the ghost altogether to accept its reality as a rough mountain track. 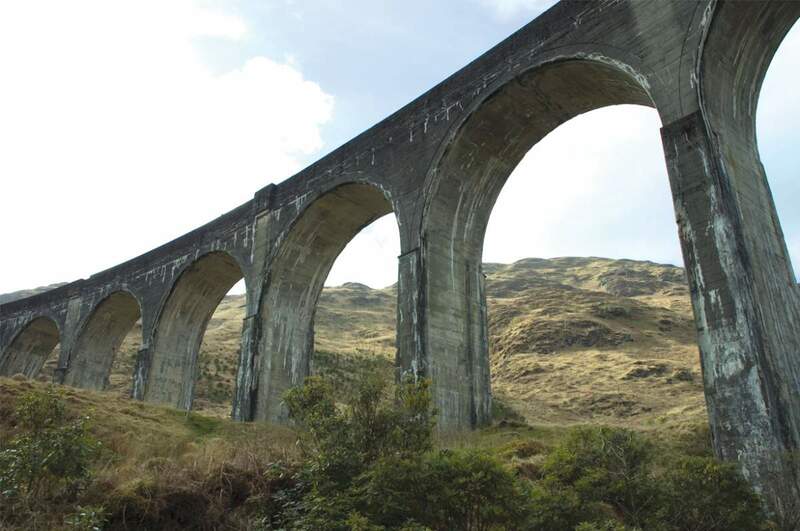 It takes us under a huge, seemingly ancient viaduct that spans the Glenfinnan valley and forms a gateway for us on our voyage into the hills. We discover our first bothy just a short distance uphill and decide to quickly investigate. 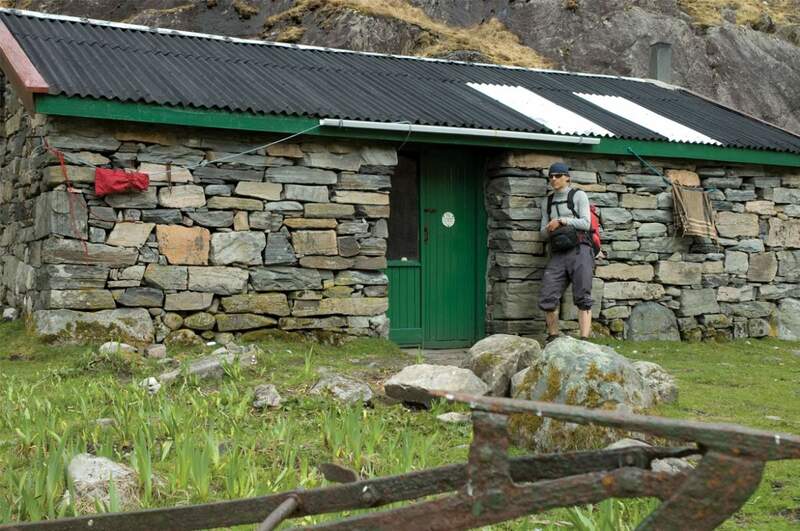 A bothy, the Scottish equivalent of a mountain hut, is a rudimentary structure in the mountains for travellers to use free of charge. A thin line of smoke rises lazily from the tiny stone building, its 18-inch thick walls giving it a primordial countenance that seems indifferent to the ravages of time. Ducking through the door, I step into a world of blackness. As my eyes adjust, I see two young men staring at me quietly from the corner of the room, their gear unpacked and their supper underway. I nod to them. There’s a giddiness in their reply that quickly bursts into a detailed report of their peak-taking exploits over the last few days. The indecipherable list of summit names wash over me like an evening breeze and gently nudge me on my way. In order to move fast, we’ve packed light, bringing only essentials like a sleeping bag, some cold food and a jacket. We have running shoes on our feet and move quickly over the broken trail. The landscape is carpeted with green and brown grass broken sporadically by small clumps of trees. This entire region was once the part of the great Caledonian Forest that covered the majority of the Scottish Highlands. Deforestation began in Neolithic times and the need to fell trees for timber, fuel and agriculture has carried on ever since. The result is a rugged landscape of rock and grassland that holds only one percent of the original forest. But the barren, wind-swept countryside possesses a magical beauty, its starkness impressing a sense of isolation from humankind while really bespeaking a history of being overrun by it. in snow, march to the horizon. As we begin our descent I notice three small figures far down the valley ahead of us. I’m surprised how quickly we gain on them. The three men in their early 60s are motion-less in deliberation when we overtake them. They’re debating how to keep their feet dry while crossing the stream that meanders down the valley. “We’ve been back and forth and don’t think there’s a way across,” explains one. “Aye, your friend has just crossed it!” exclaims another. Frank had dropped behind Dave and I to do some shooting for a small film he wants to make of this journey and is now charging back up to catch us. He’s oblivious to his surveyors and is picking the most direct line down the slope. He has little concern about wet feet. The light is starting to fade and we need to traverse around a small section of forest at the bottom of the valley before night closes in for good. We bid our group farewell and leave them, still in intense discussion. Their voices drift away from us as we descend. The ground beneath us is getting wetter and soon large hummocks of grass are our only respite from a continuous water walk. We miss the trail we’re supposed to take and find ourselves scrambling over wire fences to get back on track. I notice a herd of deer moving along the opposite side of the valley, their coats almost invisible in the graying light of dusk. It’s been more than 250 years since the last wolf was shot in these parts, leaving deer to propagate without predators. A yearly cull keeps their numbers in check and proves healthy for both the deer population and the local culinary industry. sole occupant who seems mildly alarmed by our arrival. He’s sitting on the large sleeping bench that spans the far side of the room neatly placing his gear in orderly rows and columns. Gabriel is from Germany and he’s doing the same trek we are. We make small talk about the Scottish landscape. I mention to him my familiarity with the Irish landscape, my family being from there, and he mentions he’s been there, too. “Scotland is far more beautiful. It’s much more brutal. Ireland is too soft,” says Gabriel emphatically. Dave makes a quip about missing a certain female landscape back home and Gabriel becomes quiet. He soon slips off to the other room. The raised wooden platform sleeps four in a pinch with two individuals sleeping side by side and being head to toe with the other two. We draw straws on who will sleep beside Gabriel and Frank loses. Gabriel soon returns and seems unhappy. He’s a slim fellow with a perfectionist’s temperament and is unimpressed by my rearrangement of his gear to allow more room on the bench. “My long underwear is missing!” he exclaims. I direct him to the offending garment and he relaxes. But a certain distance begins to form between us. Our fire is meager, our food is cold and sleep is welcome. My -1 degree C sleeping bag keeps me warm, but the omission of a sleeping pad leaves my hips sore and bruised. Dave shivers the entire night with only a liner bag and no pad while Frank, who slept on the cold floor in the end, sleeps in fits. Gabriel, though, sleeps like a log, wrapped tightly in his new down mummy bag, and snores most of the night. By sunrise Gabriel’s up. He sits at the far end of the platform with a steaming cup of lemon tea held out in front of him, legs crossed and lips pursed, content in his perfection. It’s a beautiful morning and the chill gets us moving as well. Gabriel will rest his aching knee today and hopes to make it through the following day. We make a quick exit for fear he might change his mind. A clear blue sky is so rare in western Scotland, we reckon this stellar morning is a gift. We head out over a grassland valley to its south slope and a small forest. The ground is still very wet and we hop over mud puddles and bog, fruitlessly trying to keep our feet dry. The ridgelines of surrounding peaks seem pasted to their cobalt blue background with only the occasional cloud, caught on some distant wind, breaking the union. We traverse two passes and descend to the tiny Sourlies bothy sitting, at ocean’s edge, just a few feet above high-tide line. The grass that surrounds it is cropped tight like a suburban lawn, but there are no overzealous landscapers here, just a countless supply of hungry sheep. The bothy is the familiar gable form with a single chimney on one end but the dry-stack stone work is striking and speaks to an age of stone masonry that has long since passed. It’s only a single room inside with a large wooden counter wrapping two walls, old bottles, candles and empty fuel canisters littering its surface. A hammock hangs from the ceiling made from the course twine used in fishing nets. We spend lunch sprawled out on the sleeping platform eating baguettes stuffed with cheese, tomatoes and salad. My thoughts drift to a cold pint of beer, but we’ve been moving a little slower than planned, the wet track and rough terrain hampering our progress; I need to keep my focus. The Sourlies bothy is located at the head of a bay where a steep-sided finger of land separates it from the next bay over. In that adjacent bay lies Inverie and the Old Forge. We follow the shoreline to the end of a spit, make our way over a small headland and drop into a vast marshland estuary that defines the end of the inlet. We make a beeline to the opposite shore bounding from one tussock to the next, a grown-up’s game of hopscotch with a penalty of a knee-high plunge in muck. The old fellas will need to convene a summit for this one. The final hurdle is a 600-metre climb out of the valley marked at its base by the skeletons of several roofless stone structures. I find out later that these dwellings are more than 400 years old and are the remains of the Highland Clearances of the late 18th and early 19th centuries, when tens of thousands of Scottish Highlanders were forcibly displaced from their homes to clear the land for large-scale sheep farming. In this land without trees, wood rafters and beams were prized family possessions, passed on from generation to the next. An evictor’s job was an easy one: just torch the roof and the task was done. 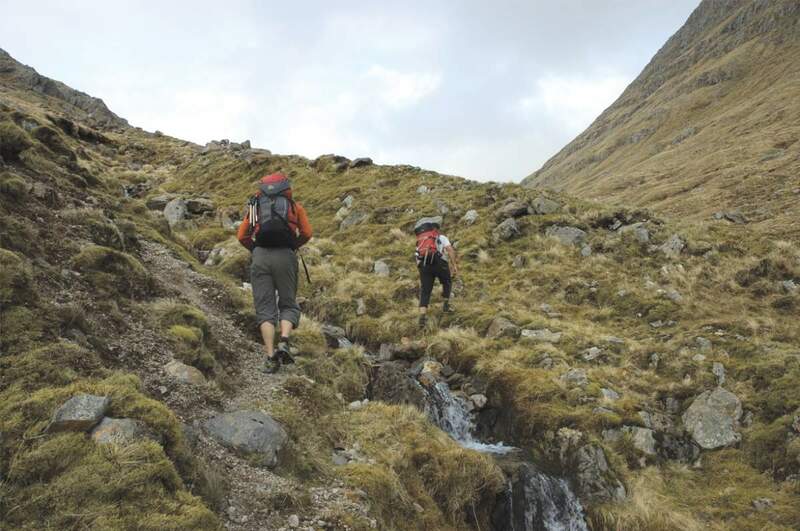 The march over the pass is slow and steady and I think about the countless thousands that must have travelled this route over the centuries—there’s evidence of human habitation from as far back as the Bronze Age on the Knoydart peninsula. Cresting the top, I peer out on a valley bathed in golden evening light, as it twists and winds its way westward to the sparkle of ocean in the distant haze. On that ocean shore is the Old Forge. Like an Everest climber, cresting the Hillary Step and seeing the summit for the first time, I become emboldened and single-minded in my quest. Dave feels it too and sets a blistering pace, plunging down the narrow, rock-strewn trail, running headlong to the sea. The valley gradually narrows and the small creek that was draining the slopes above has transformed into an impassable steep-walled river canyon in this lower section. We skirt the edge and spy a cross on a hill that marks the edge of town. Our rough track begins to change, putting on a more presentable face as it enters town. We skirt a final section of forest and follow a rock wall swathed in thick green moss for the final kilometre. Inverie is a one-road community and the route is blocked by a peacock with tail feathers erupted in full splendor. With low guttural rumblings, the majestic bird strides back and forth intent on telling us something. Whether he wants to protect a mate or find one we’re not sure but a roar pierces the air and the bird is sent scurrying. The Scottish brogue is thick and difficult to understand, but I’ve been in email contact with Drew and have been expecting him as well. Drew is leaning out the ground floor window of a small yellow house from which, it would seem, he can survey all the goings-on on ‘main’ street. He’ll be ferrying us out in the morning. Drew immediately recognizes our thirsty demeanour and points us in the direction of the Old Forge. The sun’s been a welcome companion throughout the journey and seems reluctant to leave us now at this fateful moment. Long low shadows stretch before us as a piercing red light smoulders on the white-faced buildings that sit facing the North Atlantic. Here sits our pub. Scores of happy, red-faced patrons crowd picnic tables in front of the inconspicuous structure. A row of empty aluminum beer kegs march a line to the open front door and we make our way in. In front of us is a plain wooden counter with three empty stools and a smiling bartender.